Constance Belle Fisher is a local Clarke County and Shenandoah Valley artist. She has lived in rural Northern Virginia for over 30 years. Born in the foothills of Western Pennsylvania, she was named after her paternal great grandmother, Jane Belle Poe, whose father was a second cousin of Edgar Allen Poe, and after her mother’s great grandmother, Constance, who came to this country from Belgium. Ms. Fisher has an instinctive interest and affinity for creative artistic expression. Her natural ability and talent was evident from early childhood and in the fourth grade, she received a scholarship to attend classes at the Carnegie-Mellon College of Fine Arts. She studied at the Carnegie until her family moved to Baltimore. In Baltimore, she continued her studies at the Maryland Institute College of Art while completing high school. She attended the Community College of Baltimore, Towson University and Johns Hopkins University where she worked as an assistant illustrator in the Department of Art as Applied to Medicine before moving to Virginia. She has studied with Gary Akers, Frank Webb, Joe Mayer, Tony Couch, Christopher Schink, and Skip Lawrence. Ms. Fisher is particularly influenced by the French Impressionists and by many abstract artists. She views her art as works that create a lasting image of the ever-changing scenes of both urban and rural America. 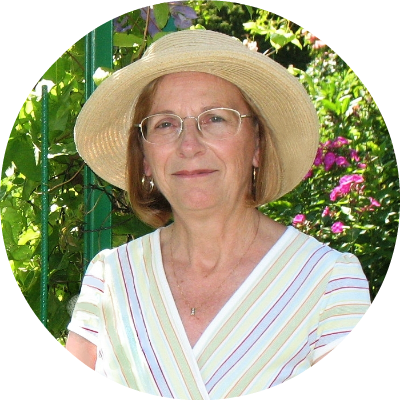 Usually working on location, she records old barns, quaint towns, city dwellers, country folk, and their unique characteristics with descriptive, romantic interpretation. Ms. Fisher’s art explores light, form, atmosphere, and color; filled with mood and movement, it elicits a response from the viewer. She recently visited Monet’s home and Gardens in Giverny, France and spent time painting along the Seine River. Her paintings are in private collections across the country. Ms. Fisher’s paintings and photography are in private collections in California, Florida, Kansas, Maryland, Missouri, New York, Virginia and Pennsylvania. She often donates her artwork to fund raising and charitable organizations. Ms. Fisher has always been very active in local community and service organizations. 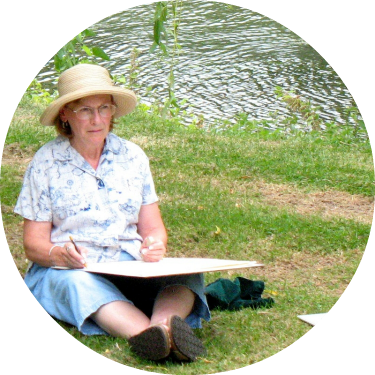 Her current and past memberships include: American Watercolor Society (Associate Member), Baltimore Watercolor Society (Associate Member), Blue Ridge Arts Council (BRAC), Shenandoah Arts Council (SAC), Graphic Artist Guild, Loudoun Sketch Club, Merrick Art Gallery, Shenandoah Valley Art Center, and Washington Art Directors Club. Ms. Fisher’s award winning art has been exhibited in numerous competitions. Among the juried shows are: Artist’s Registry Exhibition – The Dog Museum – St. Louis, Missouri, Waterford Foundation Fair, Loudoun Sketch Club, Art Show at the Dog Show – Wichita, Kansas, Susquehanna Art Society 9th Biennial, The Nature Conservancy Ecological Photo Competition, Havre de Grace Art Show, Druid Hill Art Show – Baltimore, MD, and Towson Courthouse Art Show – Towson, MD. Many of her photographs have been published in newspapers and national magazines. Her art is also represented in the book Reflections of Clarke County, Virginia. Ms. Fisher’s paintings are now available in limited edition and giclée prints.